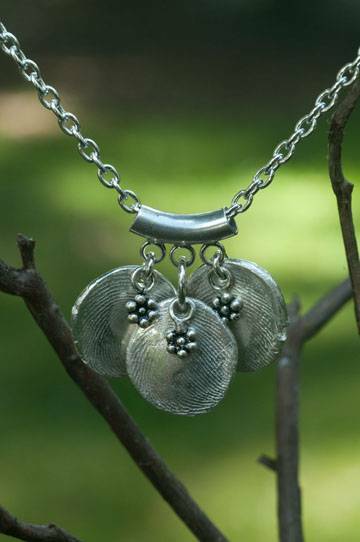 Prints Charming jewelry features fingerprints captured in 99.9% pure silver. 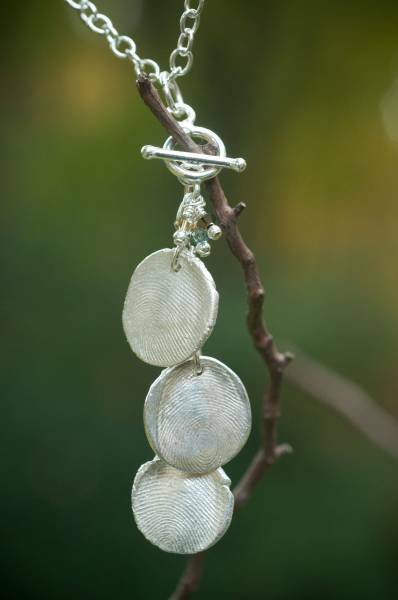 All chains and findings are Sterling silver. Each charm features your choice of a mini flower charm or a Swarovski crystal in one of several colors. Charms are finished with a shiny finish or with a patina. 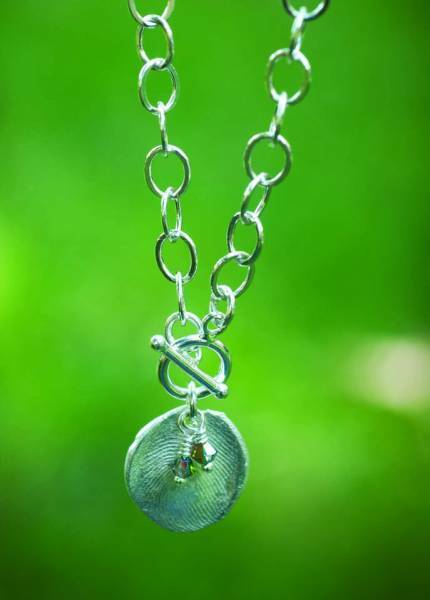 All necklaces feature an 18” chain. We can extend the length of the chain in 1" increments. An accent crystal and stamped initials (on the back of the charm) are included with each fingerprint charm. 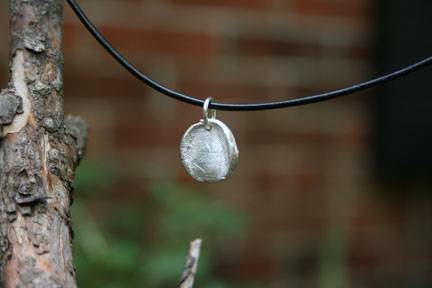 We've included pricing for up to 5 fingerprint charms on a piece. Please call 1.888.973.4254 (1.888.9REGALI) for pricing for larger numbers. Annie – The Annie necklace is the perfect solution for multiple charms. The tube, hanging on a lovely cable chain, has loops where the charms attach. Sandy - The elegant Sandy necklace has lots of movement. 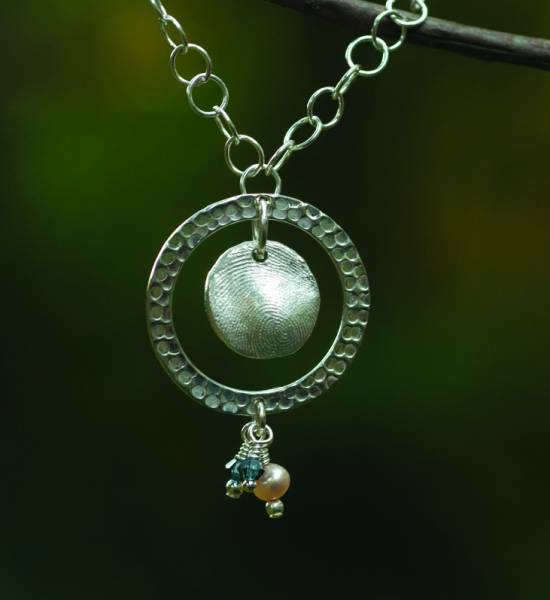 The charms and crystals dangle freely from a chain suspended from a toggle. There's no limit to the number of prints you can put on the necklace. Sophia – The gorgeous Sophia necklace features fingerprint charms hanging from the toggle at the end of the open flat cable chain. Katie - Each Katie charm is attached to a barrel tube that slides on a narrow link chain. 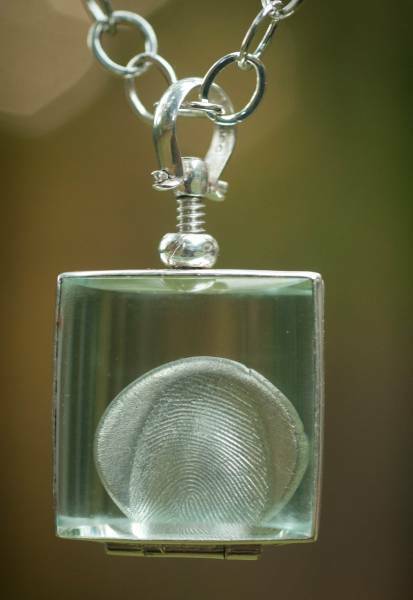 When multiple fingerprint charms are on a Katie, the barrel tube separates them a bit more than other styles. Pictured here are 2 dog paw prints (outer two) and a child's print (middle). 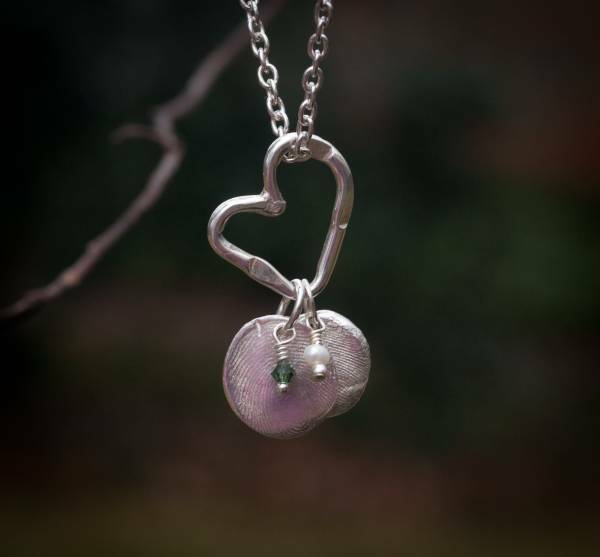 Lane - On a Lane the fingerprint charms are suspended freely from a hammered heart, which moves loosely on the chain. Kelley – The classic Kelley is classy enough for dress up but can also be worn every day. If two charms are ordered, they share a bail. (Maximum of 2 prints on this style). This photo shows the necklace with a patina finish. 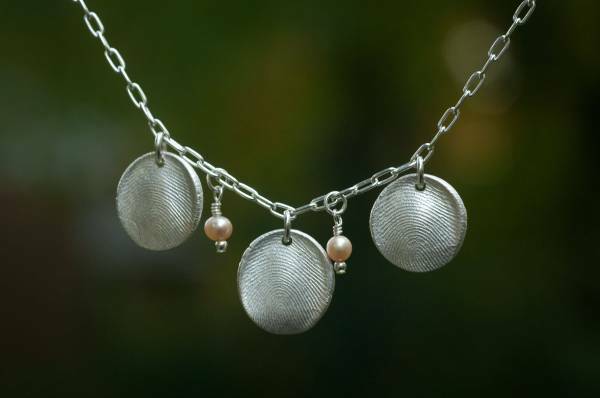 Judy– The simple ball chain is sturdy and comes in 3 lengths: 16", 18", and 20". 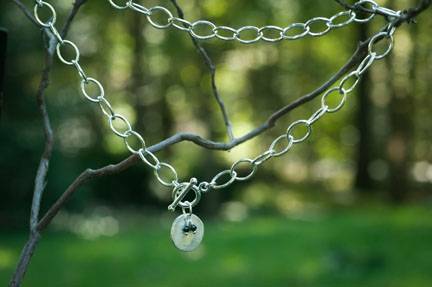 Phoebe – The lovely Phoebe takes the charm bracelet concept and translates it into a necklace. 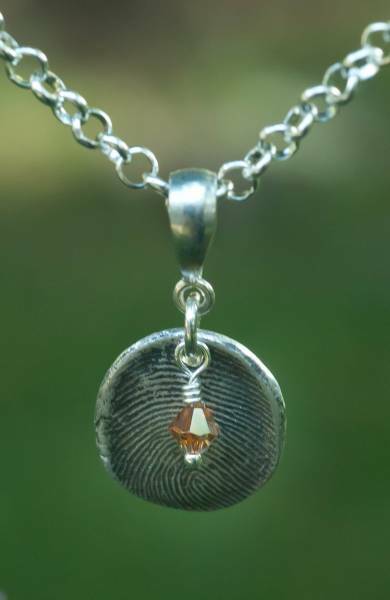 This comes with one crystal or mini charm per fingerprint charm, or you can order it as pictured. Avery - On the Avery, your special fingerprint is framed by a patterned circle. 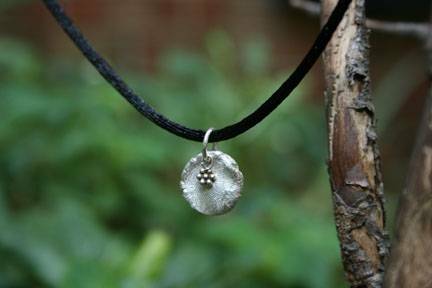 Each fingerprint charm is framed by its own circle, and the circles are hung one below the other. The accent charms (up to 3 on this model) are hung from the lowermost circle. Maria – This is the same necklace pictured on the Sophia above, with a larger 18” open flat cable chain. 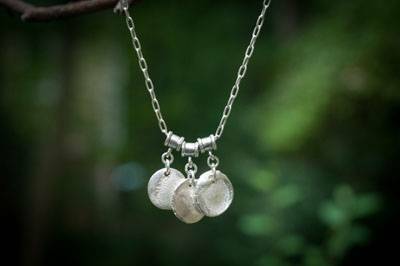 On the Maria necklace, the charms dangle from the toggle. 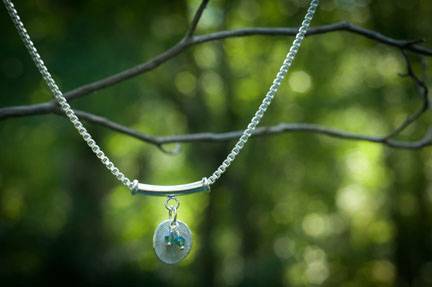 Savannah - The beautiful round glass Savannah locket holds 1 floating fingerprint and hangs from a lovely, open chain. The print is slightly magnified. This design does not include crystals. 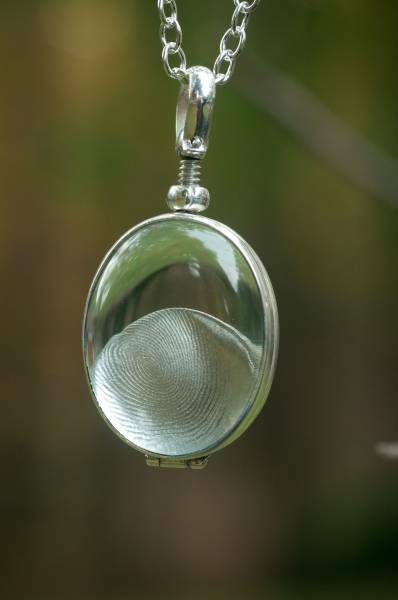 Giovanna - The stunning square glass Giovanna locket holds 1 floating fingerprint. The glass magnifies the print slightly. This design does not include crystals. 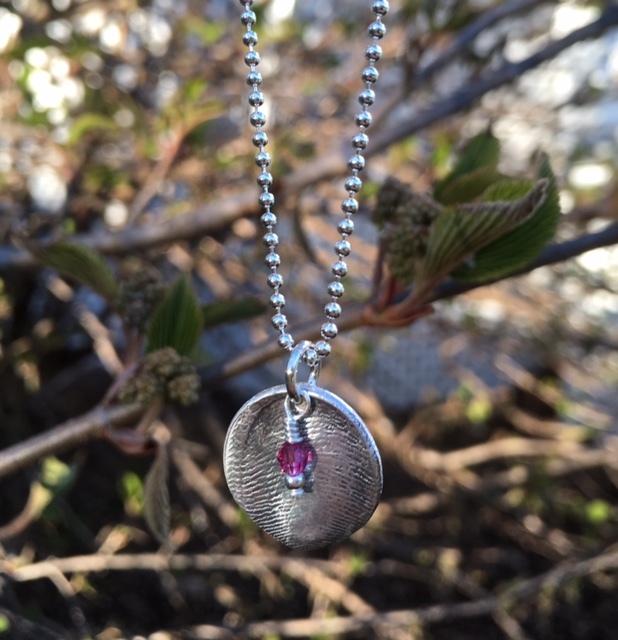 Heather – The Heather necklace features one (1) charm hung from a tube. The tube is strung on an 18” Venetian box chain. Zoe – The playful Zoe necklace features charms on a jump ring suspended from a leather strap, with a Sterling silver clasp. Kendall – The sweet Kendall necklace has the charm hanging from a satin cord, with a Sterling silver clasp. Click here to see our Bracelets. Click here to see our other Prints Charming items. With each Prints Charming charm you have your choice of 1 accent. All the accents, with the exception of the mini flower, are Swarovski crystals. We've noted which crystals are used for birthstones.